My Tried and Tested: Could lighting a candle be good for your heart? Candlelight always seems to be calming and beneficial – but now a study at Lund University in Sweden has found that inhaling candle smoke has a positive effect on how the heart regulates its rhythm. According to the press release I was sent, the researchers are not certain exactly why candles have this impact, but a qualified guess is that it is due to the salts of sodium and potassium in the smoke. The Swedish researchers carried out the study because they wanted to investigate the effects of airborne particles on health. They say: “Airborne particles are everywhere around us, and have always been. Particles generated by human activities has increased drastically since industrialization, and several epidemiological studies have shown that inhaled particles can cause adverse health effects. “The concern about health effects have during the last decade shifted towards fine and ultrafine particles, not least due to the emerging field of nanotechnology. “Of special interest are the particles to which we are exposed indoors – in the industrialized part of the world we spend around 90% of our time indoors (at home and at workplaces/schools). In other words, although we often worry about the particles we breathe in when we are outdoors – from exhaust fumes for example - we may be more exposed to these potentially harmful particles indoors than out. Good news, then, that candles have been given a clean sheet. Except they haven’t. Note the words pure stearin. Stearin is an animal or vegetable fat, discovered about 100 years ago and which became a cheaper alternative to beeswax for making candles. 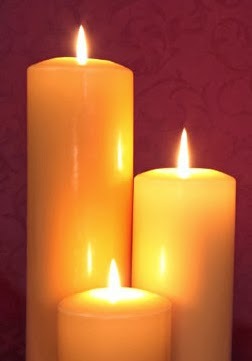 However, most of the candles we buy are made out of paraffin wax. The good news is that you don’t have to go to Scandinavia to find pure stearin candles – they are available online.